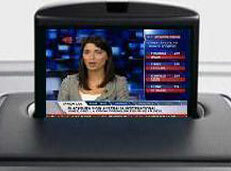 Volvo XC90 Rear DVD Package , this vehicle was fitted with 2 x 7 inch widescreen headrest monitors and a 7inch Widescreen roof mount monitor for viewing on the 3rd row of seats . Larger roof monitors can be installed if required . 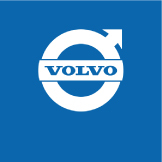 Front screen inputs & video in motion adaptors ( for passenger use) are available from most of the Volvo range if the vehicle has a navigation screen .Please contact us for information . 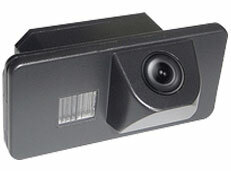 We have a range of reverse camera kits available for most models that have navigation screen fitted as standard . A vehicle specific camera is discreetly fitted to the underneath of the rear number plate light . 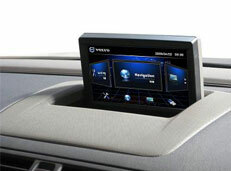 This is an aftermarket navigation system for volvo without factory navigation . These kits fit in the factory location and feature , Touchscreen panel , uk & euro navigation software , 2 SD inputs ,usb input , video input and output and reverse camera input . Systems are available for XC60,XC90,S40 & S80. 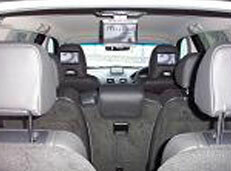 The system also intergrate with the factory CD Changer if the vehicle has one already fitted.